Emotional Intelligence is the most important skill you can acquire across the span of Your One Precious Life. It impacts every single area of your life, your relationships, your health and wellbeing, your psychological state and of course your career, whatever your calling may be. Unlike your IQ—the measure of your intellectual capacity, which becomes fixed in all of us by the time we reach the end of our teenage years—you can continue to develop and enhance your Emotional Intelligence throughout your entire life, if you choose to and if you know how to. But how do you actually develop and enhance your Emotional Intelligence? The answer perhaps surprisingly, is similar to how you would go about developing your physical ability, you do this by engaging in exercises which increase your physical capacity and your health and wellbeing—usually at a gymnasium, a yoga or pilates studio, or a similar establishment—it takes energy, time and commitment. Pathways to Emotional Intelligence is a four day, intensive, developmental experience, unlike any you will ever have experienced, which will challenge you to breakthrough the barriers to fulfilling your potential. A gymnasium for your mind and your psyche. 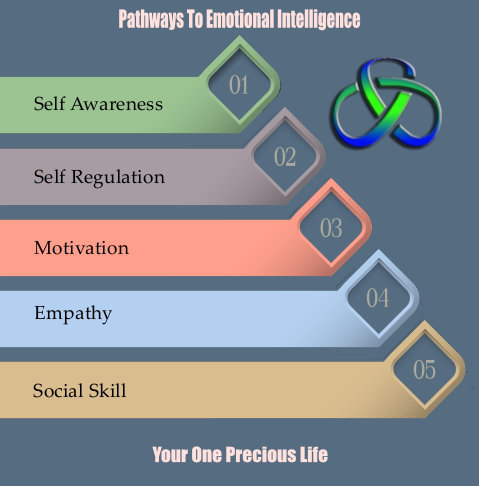 You will travel through each the five ‘Pathways To Emotional Intelligence’, developing an understanding and awareness of your current capacity in each of the five areas, and you will work towards developing, improving and enhancing your abilities in all five pathways. You will experience a measurable increase in your EQ—the measure of your Emotional Intelligence—throughout the four days. Crawley, West Sussex, May 21st—24th 2019. You will find that your Pathways Experience challenges many of the basic beliefs you hold about yourself and your abilities. You will become aware of all the ways you ‘trip yourself up’ in your life and in your interactions with others, you will develop a strategy to enable you to stop doing this—immediately. You will acquire and take away a set of tools and skills which will enable you to keep yourself on-track and will ensure that you continue to develop your EQ as you move forwards and onwards into your future—Your One Precious Life! Setting goals, aims and objectives. Developing realistic achievable plans for yourself. Understanding how to relate to others better. Understanding and getting to grips with how you motivate yourself, and if you are a leader, motivating others. Working better in teams. Developing your creativity. Unleashing and fulfilling your potential. Leadership, expanding your leadership ability and capacity, understanding the interpersonal dynamics that create high performing groups and teams. Becoming an Authentic Leader. Developing leaders. Understanding your personality type, your preferences for interacting with others, playing to your strengths and overcoming your weaknesses. Understanding the personality of those you work with and lead, and helping them to work to their strengths. Managing all areas of your life, fully and competently, Planning for and creating the future you wish. Developing deep personal authenticity. Walking Your Own Walk and Talking Your Own Talk. Reserve Your Seat On The One Precious Lifeboat Here! This experiential programme, is a group personal development workshop that releases human potential and productivity by building unparalleled levels of self-awareness, self-acceptance and self-accountability. Are you a practitioner, coach, consultant, counsellor, or therapist? Would you like to learn how to offer this approach to your clients? Contact me to find out how you can do this.